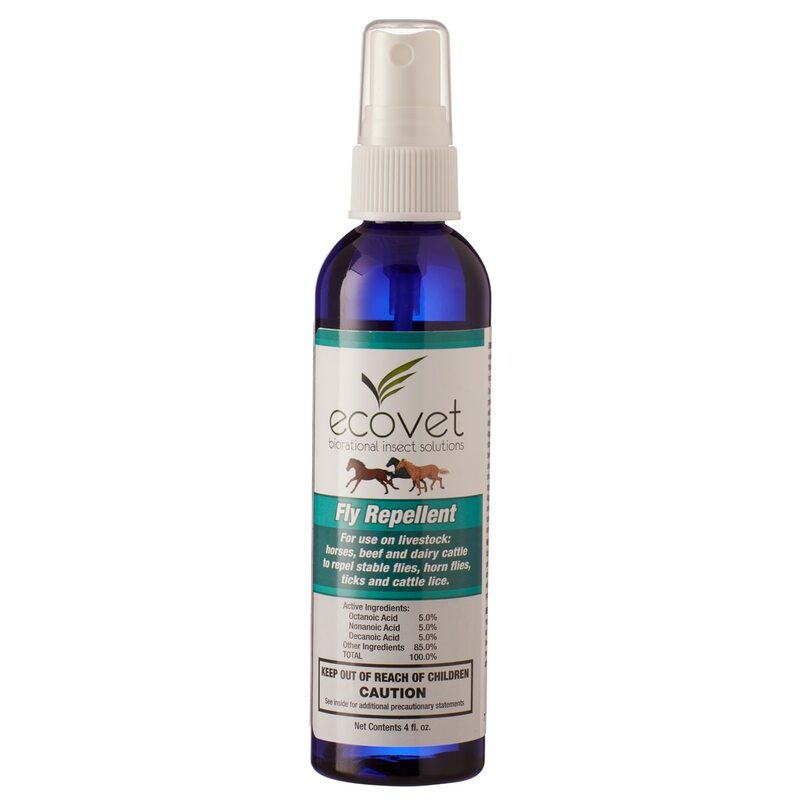 Ecovet Fly Repellent - NEW Fresh Scent! Ecovet, available in a new fresh scent, is a new alternative to traditional fly products containing pyrethrins or essential oils. Research has shown that certain fatty acids act as insect attractants, while others are repellents. 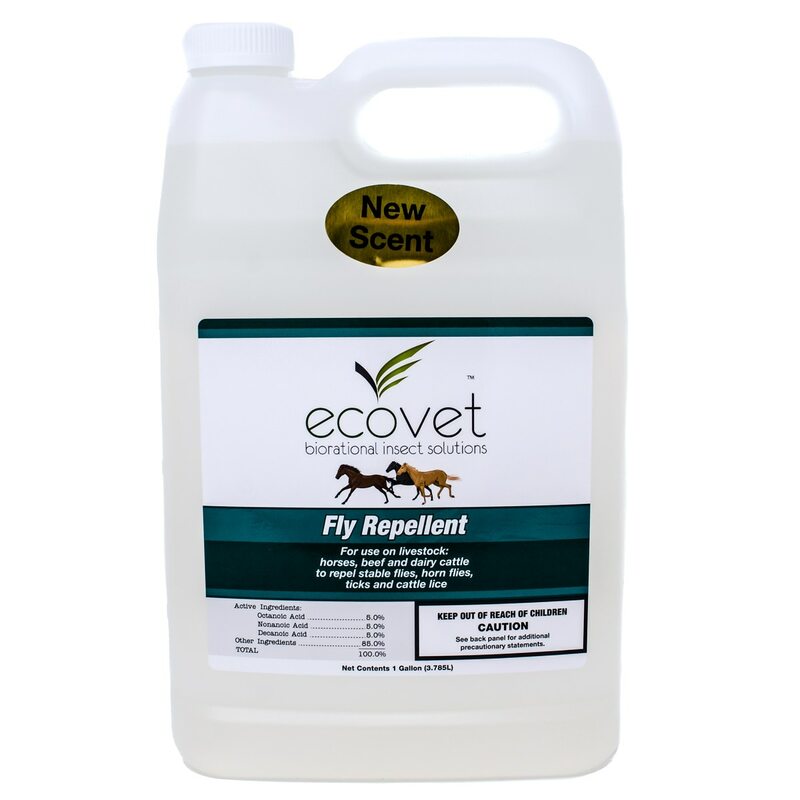 Ecovet uses a proprietary mixture of naturally occurring fatty acids that confuses and overwhelms the insect’s normal directional ability, so the insect is unable to locate your horse as its next victim. It’s like having a GPS system that is shouting confusing and conflicting directions at you … until you finally give up. Click Here for important FAQ's! Real alternative to toxic pesticides. 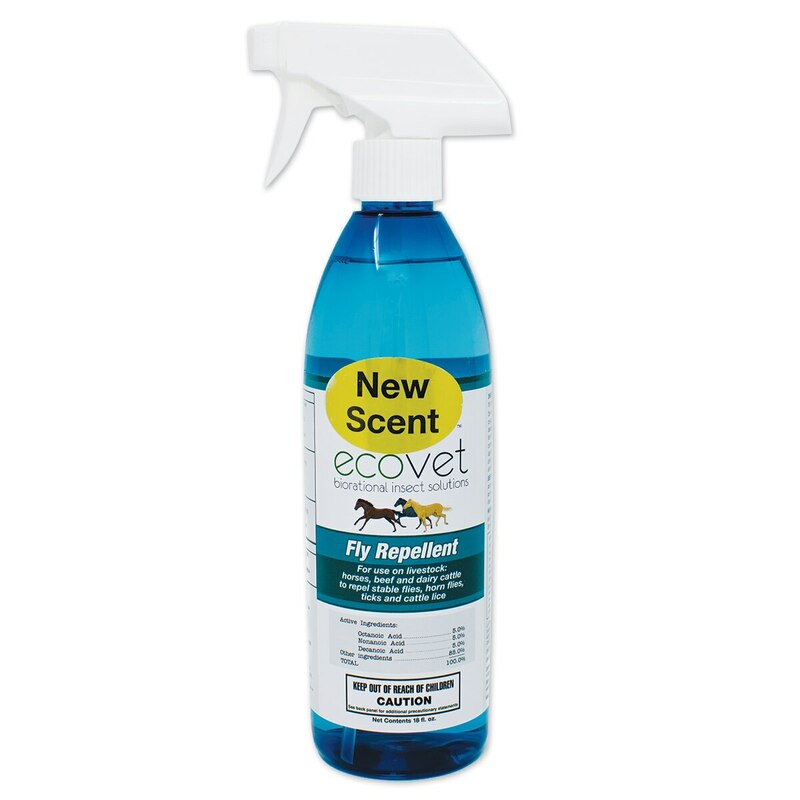 Ecovet Fly Repellent - NEW Fresh Scent! is rated 3.9 out of 5 by 151. Rated 5 out of 5 by Kathy from Best ever! This stuff works. Do not breathe it or let your horse breathe too much of it, but if you need to keep flies off, this is the product for you. I used it camping where there are tons of gnats and all the other horses were swishing tails and my guy was standing calmly. So glad I had this spray. You can also use a small amount on the back of fly mask ears and it helps keep the bugs away from their faces. Rated 5 out of 5 by KATE from IT WORKS!!! The ONLY fly spray I’ve ever used that really does keep those leg biting flies off. Rated 3 out of 5 by KAL74 from Horrid smell, but actually works! This fly spray actually takes my breath away it smells so horrible. The smell is of intense chemical I’m not even sure how it’s natural. However it actually does really work!! I will not order this again until they figure out how to make it smell better. It makes all the horses in the barn sneeze until the spray settles, and it literally takes my breath away. Rated 1 out of 5 by Maui from Smells horrible! Doesn't work well The product says 'new scent' so I'm guessing there were issues before, and unfortunately it smells horrible. We could smell it from several feet away when we first put it on (nearly unbearable), but then there were flies on my horse 20 min later. Very disappointing. Rated 4 out of 5 by Ashley from If only fly spray still worked... I ordered a bottle of this after having it recommended by a friend. As most people I know, nothing is working this year for flies, and it seems to be even worse in New England. We have been having a hot humid weather in Maine this year and I have yet to find a fly spray that works. I was hopeful that this would work, but my horse didn't stomp, bite, swish any less than he did before I used this. I will be placing an order for a fly sheet and fly boots as it seems the flies have built up a tolerance to fly spray. I also don't like that the bottle states 85% other ingredients. I wish it showed the entire list of what is in the bottle. The smell is also horrendous. Rated 5 out of 5 by KCinDC from Only fly spray that works I started using this spray this year and will not be without it again! It's literally the only spray I can use on my horse that repels stable flies and doesn't cause his skin to react (unlike Pyranha). It is VERY strong and I only spray it outside the barn - it doesn't seem to bother my horse, but it causes me to start coughing if I inhale it. I only wish it came in an in-between size - 18 oz doesn't last long, and a gallon is way too much! Tip: wear a painter's mask/respirator and use a brush or towel when applying. Rated 3 out of 5 by Vmcilrath from Can’t get past the smell, but does work. So, I know that this stuff works well compared to a lot of other sprays. It works differently, and there is value in keeping in my fly control arsenal, but I find the smell pretty unbearable! My horses don’t like it either. Strong, weird chemical odor. Rated 4 out of 5 by Rosie from EcoVet New scent! Still find it very pricey. I give it a 8 on a 1-10 scale. Rated 1 out of 5 by pammers from Anti-breathing Bought first gallon mid July. How can this AMINO ACID new scent formula be safe for horses when I cannot breathe when applying ......the benzene in it chokes off air in applier. Happened with everyone in our barn. I put a finger swip on my cheek to check on skin reception .... had to wash it immd as it burned my face ...... so is it burning my horses skin??????? Please reformulate as this current model will not be repurchased.